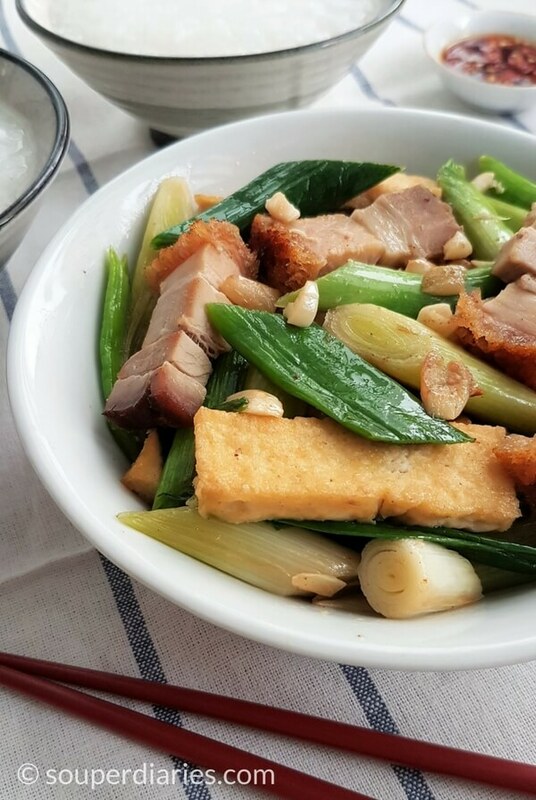 This simple dish of stir fry leeks with roast pork and tofu is utterly delicious, easy to cook and is one of my favourite home-cooked dishes. Leeks can also be paired with other vegetables, meat or seafood for a quick stir-fry. Leeks are a common vegetable but during Chinese New Year, they are considered auspicious to eat as they carry a symbolic meaning. Chinese leek (大蒜) or ‘dasuan’ in Mandarin sounds like ‘counting’ and it symbolizes wealth (having lots of money to count). So it is a must-have food for many who celebrate the CNY. Smaller than Western leeks, Chinese leeks are somewhat more pungent. 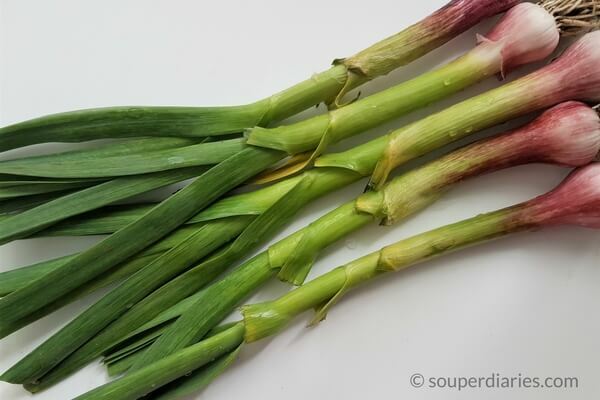 These leeks have a delicately sweet flavor reminiscent of garlic which I really enjoy. Normally, the bulbs are white. But I found these leeks with purple hued bulbs in the market today. Apparently, they’re only available during the CNY period. They have to be washed thoroughly before cooking as there is a lot of soil trapped in between the folds of the leek. Try to get leek of similar size so they will be cooked in the same time. Separate the stalks and leaves before frying as the leaves take a shorter time to cook. Try not to overcook the leaves or it will turn very soft (unless you like it that way). If you prefer seafood, you can also substitute the roast pork with shrimps. Sometimes I will use both shrimps and roast pork. Go easy on the seasoning as the roast pork is already quite salty. I only had to add some light soy sauce to enhance the flavor. You may also add a little salt if you wish but only if necessary. This dish is made with just a few simple ingredients. Put together, the taste is greater than the sum of its parts. Simple and delicious. Serve hot with some plain rice or congee. Enjoy! 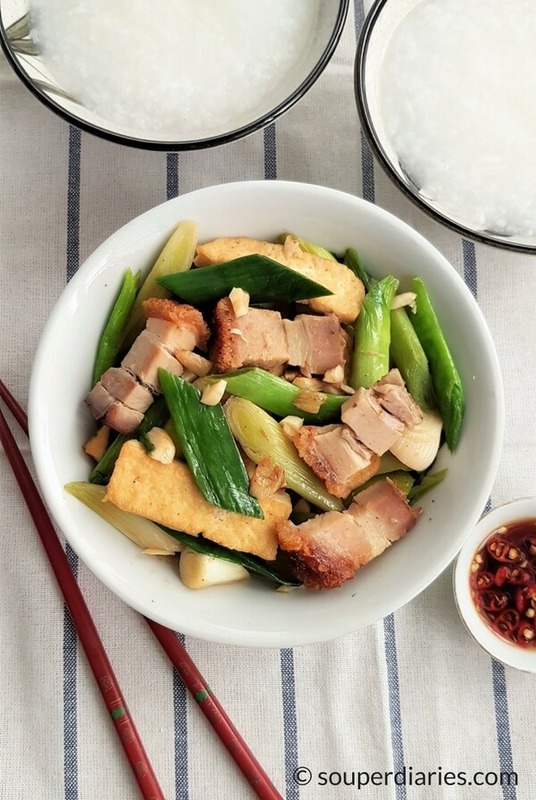 Naturally sweet, fragrant and delicious leeks are paired with roast pork and tofu in this quick stir-fry. Peel off dried outer leaves from the leeks. Cut off the roots. Slice the leek diagonally into 2 inch strips. Wash with water a few times to remove dirt and soil between the layers of the leaves. Separate the stalks and leaves and set aside. Heat up oil in a wok. 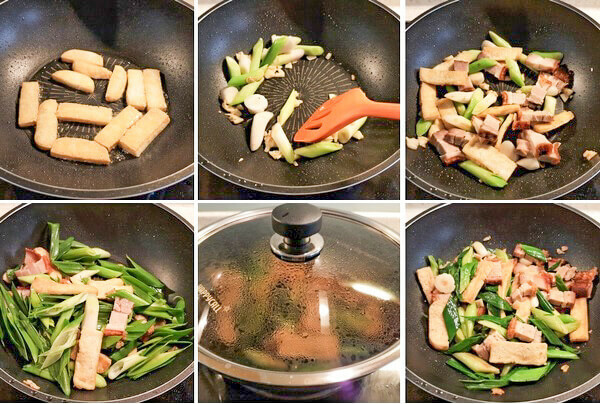 Fry bean curd pieces till light brown and set aside. Add garlic and fry till fragrant. Add the stalks and stir fry for about a minute till slightly softened. Add roast pork and fried bean curd pieces. Stir fry for about a minute before adding the remaining leaves. Stir fry briefly. Pour in light soy sauce and water. Mix well and cover with lid. Simmer for about 2 minutes. Turn off heat and serve hot with plain white rice or porridge. I have to say, Yvonne, I’m not the best clock in the world – not naturally gifted in the kitchen department at all. And that’s why I love your recipes, as I find them so easy to follow and to execute. This particular one then seems to me very quick to make when I’m back from work in the evening, or as an idea to use up leftover roast pork from your Sunday meal. And it sounds very well balanced in having the right combination of vegetables, meat and tofu. once again, another mouth watering idea!! Is this 7-layer pork? I was introduced to it many years ago and your graphics are making my taste buds tingle. Which meats do you favor for stir frying and are salty or marinated meats easier to work with? Thanks for including the recipe at the bottom. This makes it a lot more convenient to add to my recipe book. I’d have to admit that the shrimp version grabbed my attention as well. Thanks for writing in. No, it’s roast pork and not 7 layer pork. You can use any type of meat for stir-fries but they have to be thinly sliced as the stir-frying process is very quick. It may be marinated before cooking. In this dish, I didn’t have to marinate as the roast pork is already salty and flavorful. You can absolutely replace the roast pork in this dish with shrimps. Works very well too. As always, your recipes always look delicious and you give wonderful directions along with the recipe. I have one question as I am not super familiar with leeks. What vegetable do they taste most like? I just ask because I don’t know and this recipe looks yummy! I’m not into cookery but I am feeling hungry just by reading this.